Within the framework of the internal market, requirements for the noise emission by equipment for use outdoors have to be harmonised in order to prevent obstacles to the free movement of such equipment. Reducing permissible noise levels for such equipment will protect the health and well-being of citizens as well as protect the environment. The public should also be provided with information on the noise emitted by such equipment. Community legislation concerning noise emission by equipment for use outdoors has consisted to date of the following nine directives covering some types of construction machinery and lawnmowers: Council Directive 79/113/EEC of 19 December 1978 on the approximation of the laws of the Members States relating to the determination of the noise emission of construction plant and equipment ( 4 ), Council Directive 84/532/EEC of 17 September 1984 on the approximation of the laws of the Member States relating to common provisions for construction plant and equipment ( 5 ), Council Directive 84/533/EEC of 17 September 1984 on the approximation of the laws of the Member States relating to the permissible sound power lever of compressors ( 6 ), Council Directive 84/534/EEC of 17 September 1984 on the approximation of the laws of the Member States relating to the permissible sound power level of tower cranes ( 7 ), Council Directive 84/535/EEC of 17 September 1984 on the approximation of the laws of the Member States relating to the permissible sound power level of welding generators ( 8 ), Council Directive 84/536/EEC of 17 September 1984 on the approximation of the laws of the Member States relating to the permissible sound power level of power generators ( 9 ), Council Directive 84/537/EEC of 17 September 1984 on the approximation of the laws of the Member States relating to the permissible sound power level of powered hand-held concrete-breakers and picks ( 10 ), Council Directive 84/538/EEC of 17 September 1984 on the approximation of the laws of the Member States relating to the permissible sound power level of lawnmowers ( 11 ) and Council Directive 86/662/EEC of 22 December 1986 on the limitation of noise emitted by hydraulic excavators, rope-operated excavators, dozers, loaders and excavator-loaders ( 12 ), hereinafter referred to as ‘existing Directives’; these Directives lay down the requirements with regard to permissible noise levels, noise test codes, marking and conformity assessment procedures for each type of equipment separately. A simplification of this legislation and the creation of a framework for the reduction of noise emission by equipment for use outdoors is appropriate. This Directive is based on the principles and concepts set out in the Council Resolution of 7 May 1985 on a new approach to technical harmonisation and standards ( 13 ). The aforementioned principles have been further developed in the Council Decision 93/465/EEC of 22 July 1993 concerning the modules for the various phases of the conformity assessment procedure and the rules for the affixing and use of the CE conformity marking, which are intended to be used in the technical harmonisation directives ( 14 ). The Fifth Environmental Action Programme attached to the resolution of 1 February 1993 ( 15 ) identifies noise as one of the most pressing environmental problems in urban areas and the need to take action with regard to various noise sources. In its Green Paper ‘Future Noise Policy’, the Commission addressed noise in the environment as one of the main local environmental problems in Europe, and announced its intention to propose a framework directive to control noise emission by equipment for use outdoors. Member States should ensure that equipment covered by this Directive complies with the requirements thereof when placed on the market or put into service in the Member States. Requirements protecting workers by regulating the use of outdoor equipment are not affected by this Directive. Member States should not prohibit, restrict or impede the placing on the market or putting into service in their territory of equipment which complies with the requirements of this Directive, bears the CE marking and the indication of the guaranteed sound power level and is accompanied by an EC declaration of conformity. The manufacturer or his authorised representative established in the Community should be responsible for ensuring that the equipment is in conformity with the provisions of this Directive and of any other directives that apply to it. The manufacturer or his authorised representative established in the Community should affix the CE marking and the indication of the guaranteed sound power level to the equipment and ensure that the equipment is accompanied by an EC declaration of conformity in order to certify thereby that the equipment is in conformity with the provisions of this Directive and any other pertinent directives. Member States, if necessary in cooperation with other Member States, should take all appropriate measures to ensure that non-complying equipment will comply in future or is withdrawn from the market. A sound implementation and application of this Directive is indispensable to meet the objectives of this Directive. A closer cooperation in the market surveillance by means of a continuous exchange of information is necessary. Therefore a Committee should be established. Marking of equipment for use outdoors with its guaranteed sound power level is essential in order to enable consumers and users to make an informed choice of equipment and as a basis for regulation on use or economic instruments to be adopted at the local or national level. This marking must be clear and unambiguous. The indicated values should be guaranteed by the manufacturer. It is appropriate that the indication of the noise emission in the form of the guaranteed sound power level should accompany the CE marking. A unified, fixed procedure to assess noise emission values is an indispensable condition for reliable marking. Existing directives concerning compressors, tower cranes, welding and power generators, and concrete-breakers and picks require the Commission to submit proposals to reduce the permissible noise levels. Noise reduction technology for some other equipment for use outdoors (e.g. graders, loader-type landfill compactors, dumpers, combustion-engine driven counterbalanced lift trucks, mobile cranes, builders' hoists, construction winches, compaction machines, paver-finishers and hydraulic power packs) is available but not generally used. Surveys show that the noise emission values of equipment for use outdoors of the same power currently on the market can differ by more than 10 dB. It is appropriate to reduce noise emissions by equipment subject to noise limits down to the level of the better performers on the market today in two stages, in order to allow manufacturers who do not already comply with the requirements sufficient time to adapt their equipment to the more demanding limit values. Different conformity assessment procedures may be considered appropriate for different categories of equipment. Decision 93/465/EEC offers different modules for use in conformity assessment procedures. For equipment subject to permissible sound power levels, a procedure consisting of an involvement of a notified body for checking the conformity with the provisions of this Directive in the design and the production phase is considered to be appropriate. Self certification is considered appropriate for equipment subject to noise marking only. Monitoring is indispensable. The technical and administrative standards of notified bodies throughout the Community should be the same. This can only be achieved by setting minimum criteria they have to meet. The collection of noise data is considered to be indispensable as a basis for informed consumer choice and for the Member States' and the Commission's further assessment of new technological development and the need for further legislative action. These noise data can be collected by simply sending a copy of the EC declaration of conformity to the Member State and the Commission. In order to protect citizens against unreasonably high noise exposure, Member States should be able to restrict, in accordance with the provisions of the Treaty, the use of equipment in the environment. The technical provisions concerning the measurement methods must be supplemented and adapted as necessary to technical progress and the progress in European standardisation. The measures necessary for the implementation of this Directive should be adopted in accordance with Council Decision 1999/468/EC of 28 June 1999 laying down the procedures for the exercise of implementing powers conferred on the Commission ( 16 ). It is important to have lower noise emission limits for lawnmowers and lawn trimmers/lawn edge trimmers which have remained unchanged since the adoption of Directive 84/538/EEC. To give guidance to industry, indicative figures for lower limits should be introduced for stage II. The Commission should submit a report to the European Parliament and the Council on whether and to what extent technical progress allows a reduction of limit values for lawnmowers and lawn trimmers/lawn edge trimmers, and, if appropriate, submit a proposal to amend this Directive. The aim of this Directive is to harmonise the laws of the Member States relating to noise emission standards, conformity assessment procedures, marking, technical documentation and collection of data concerning the noise emission in the environment of equipment for use outdoors. It will contribute to the smooth functioning of the internal market, while protecting human health and well-being. 1. This Directive applies to equipment for use outdoors listed in Articles 12 and 13 and defined in Annex I. This Directive only covers equipment that is placed on the market or put into service as an entire unit suitable for the intended use. Non-powered attachments that are separately placed on the market or put into service shall be excluded, except for hand-held concrete-breakers and picks and for hydraulic hammers. — equipment specially designed and constructed for military and police purposes and for emergency services. 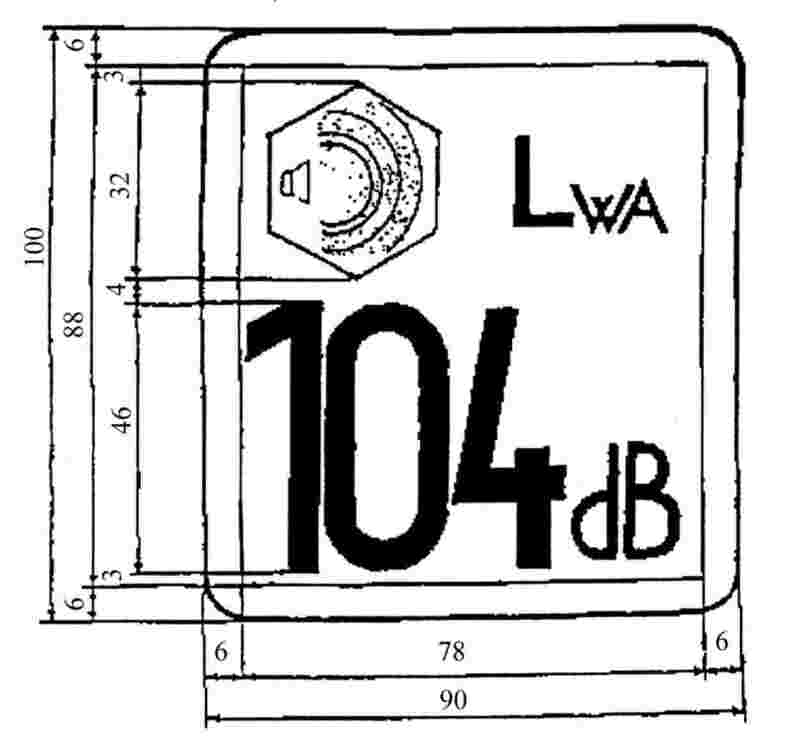 (f) ‘guaranteed sound power level’ means a sound power level determined in accordance with the requirements laid down in Annex III which includes the uncertainties due to production variation and measurement procedures and where the manufacturer, or his authorised representative established in the Community, confirms that according to the technical instruments applied and referred to in the technical documentation it is not exceeded. — the equipment bears CE marking and the indication of the guaranteed sound power level and is accompanied by an EC declaration of conformity. 2. Where neither the manufacturer nor his authorised representative is established in the Community, the obligations of this Directive shall apply to any person placing the equipment on the market or putting it into service in the Community. 1. Member States shall take appropriate measures to ensure that equipment referred to in Article 2(1) may be placed on the market or put into service only if it conforms to the provisions of this Directive, bears the CE marking and the indication of the guaranteed sound power level and is accompanied by an EC declaration of conformity. 2. The competent authorities of the Member States shall assist each other in fulfilment of their obligations to carry out market surveillance. 1. Member States shall not prohibit, restrict or impede the placing on the market or putting into service in their territory of equipment referred to in Article 2(1) which complies with the provisions of this Directive, bears the CE marking and the indication of the guaranteed sound power level and is accompanied by an EC declaration of conformity. 2. At trade fairs, exhibitions, demonstrations, and similar events, Member States shall not prevent the showing of equipment referred to in Article 2(1) which does not conform to the provisions of this Directive, provided that a visible sign clearly indicates that such equipment does not conform and that it is not placed on the market or put into service until it has been brought into conformity by the manufacturer or his authorised representative established in the Community. During demonstrations adequate safety measures shall be taken to ensure the protection of persons. Member States shall presume that equipment referred to in Article 2(1) bearing the CE marking and the indication of the guaranteed sound power level and which is accompanied by the EC declaration of conformity conforms to all the provisions of this Directive. 1. The manufacturer, or his authorised representative established in the Community, of equipment referred to in Article 2(1) shall, in order to certify that an item of equipment is in conformity with the provisions of this Directive, draw up an EC declaration of conformity for each type of equipment manufactured; the minimum content of this declaration of conformity is laid down in Annex II. 2. A Member State may require that the declaration of conformity be drawn up in or translated into the official Community language or languages determined by the Member State when equipment is placed on the market or put into service in its territory. 3. The manufacturer, or his authorised representative established in the Community, of equipment referred to in Article 2(1) shall keep a specimen of the EC declaration of conformity for 10 years from the date on which the equipment was last manufactured, together with the technical documentation as provided for in Annex V point 3, Annex VI point 3, Annex VII point 2, Annex VIII points 3.1 and 3.3. 1. Where a Member State ascertains that equipment referred to in Article 2(1) which is placed on the market or put into service does not comply with the requirements of this Directive, it shall take all appropriate measures so that the manufacturer or his authorised representative established in the Community shall bring the equipment into conformity with the provisions of this Directive. the Member State concerned shall take all appropriate measures to restrict or prohibit the placing on the market or putting into service of the equipment in question or to ensure that it is withdrawn from the market. The Member State shall immediately inform the Commission and the other Member States of such measures. — the measures are unjustified, it shall immediately so inform the Member State which took the initiative, the other Member States and the manufacturer or his authorised representative established in the Community. Any measure taken by a Member State pursuant to this Directive which restricts the placing on the market or putting into service of equipment covered by this Directive shall state the exact reasons on which it is based. Such a measure taken shall be notified as soon as possible to the party concerned, who shall at the same time be informed of the legal remedies available to him under the laws in force in the Member State concerned and of the time limits to which such remedies are subject. 1. Equipment referred to in Article 2(1) placed on the market or put into service which complies with the provisions of this Directive shall bear the CE marking of conformity. The marking shall consist of the initials ‘CE’. The form of the marking to be used is shown in Annex IV. 2. The CE marking shall be accompanied by the indication of the guaranteed sound power level. A model of this indication is given in Annex IV. 3. The CE marking of conformity and the indication of the guaranteed sound power level shall be affixed in a visible, legible and indelible form to each item of equipment. 4. The affixing of markings or inscriptions on the equipment which are likely to be misleading with regard to the meaning or the CE marking or to the indication of the guaranteed sound power level shall be prohibited. Any other marking may be affixed to the equipment, provided that the visibility and legibility of the CE marking and the indication of the guaranteed sound power level is not thereby reduced. 5. Where the equipment referred to in Article 2(1) is subject to other directives concerning other aspects and which also provide for the affixing of the CE marking, the marking shall indicate that such equipment also fulfils the provisions of those directives. However, should one or more of these directives allow the manufacturer, during a transitional period, to choose which arrangements to apply, the CE marking shall indicate that the equipment only fulfils the provisions of the directives applied by the manufacturer. In this case the particulars of those directives, as published in the Official Journal of the European Communities, must be given in the documents, notices or instructions required by those directives and accompanying such equipment. Annex I, item 57. Measurement: Annex III, Part B, item 57. (1) P el for welding generators: conventional welding current multiplied by the conventional load voltage for the lowest value of the duty factor given by the manufacturer. — lawnmowers, lawn trimmers/lawn-edge trimmers. (3) For single-engine mobile cranes, the figures for stage I shall continue to apply until 3 January 2008. After that date, stage II figures shall apply. Annex I, item 56. Measurement: Annex III, Part B, item 56. — the full quality assurance procedure referred to in Annex VIII. 2. Before placing on the market or putting into service any equipment referred to in Article 13 the manufacturer, or his authorised representative established in the Community, shall subject each type of equipment to the internal control of production procedure referred to in Annex V.
3. Member States shall ensure that the Commission and any other Member State may, on a reasoned request, obtain all information used during the conformity assessment procedure concerning a type of equipment and in particular the technical documentation provided for in Annex V item 3, Annex VI item 3, Annex VII item 2, Annex VIII items 3.1 an 3.3. 1. Member States shall appoint bodies under their jurisdiction to carry out or supervise the conformity assessment procedures referred to in Article 14(1). 2. Member States shall appoint only such bodies which comply with the criteria set out in Annex IX. The fact that a body complies with the criteria of Annex IX to this Directive does not mean that a Member State is obliged to appoint that body. 3. Each Member State shall notify the Commission and the other Member States of the bodies which they have appointed, together with the specific tasks and examination procedures which these bodies have been appointed to carry out and the identification numbers assigned to them beforehand by the Commission. 4. The Commission shall publish a list of the notified bodies in the Official Journal of the European Communities along with their identification numbers and the tasks for which they have been appointed. The Commission shall ensure that the list is kept up to date. 5. A Member State must withdraw its notification if it finds that the body no longer meets the criteria referred to in Annex IX. It shall forthwith inform the Commission and the other Member States accordingly. 1. Member States shall take the measures necessary to ensure that the manufacturer, or his authorised representative established in the Community, shall send to the responsible authority of the Member State where he resides or where he places on the market or puts into service the equipment referred to in Article 2(1) and to the Commission a copy of the EC declaration of conformity for each type of equipment referred to in Article 2(1). 2. The Commission shall collect the data made available in accordance with paragraph 1 for all equipment. 3. Member States may, on request, obtain the collected data from the Commission. — such requirements as they may deem necessary to ensure that persons are protected when using the equipment in question, provided that this does not mean that the equipment is modified in a way not specified in this Directive. Those measures, designed to amend non-essential elements of this Directive, shall be adopted in accordance with the regulatory procedure with scrutiny referred to in Article 18(2). (c) provide advice to the Commission with respect to the conclusions and amendments referred to in Article 20(2). (d) a statement setting out an integrated range of instruments to be used in continuing the reduction of noise by equipment. 2. After having held all the necessary consultations, in particular with the Committee, the Commission shall on that occasion present its conclusions and where appropriate any amendment to this Directive. 1. Directives 79/113/EEC, 84/532/EEC, 84/533/EEC, 84/534/EEC, 84/535/EEC, 84/536/EEC, 84/537/EEC, 84/538/EEC and 86/662/EEC shall be repealed on 3 January 2002. 2. 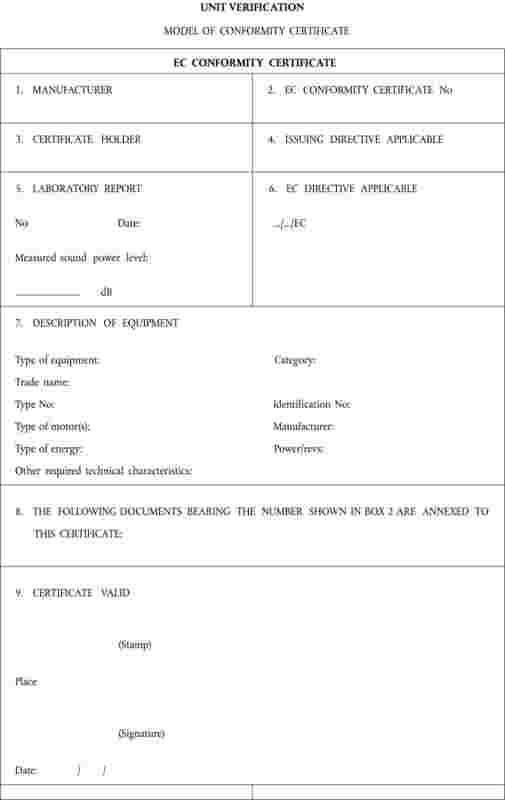 Type-examination certificates issued and measurements of equipment carried out under the Directives mentioned in paragraph 1 may be used in drawing up the technical documentation provided for in Annex V point 3, Annex VI point 3, Annex VII point 2, Annex VIII points 3.1 and 3.3 of this Directive. 1. Member States shall adopt and publish the laws, regulations and administrative provisions necessary to comply with this Directive no later than 3 July 2001. They shall forthwith inform the Commission thereof. 2. Member States shall apply these measures with effect from 3 January 2002. However, Member States shall allow the manufacturer, or his authorised representative established in the Community, to avail himself of the provisions of this Directive as from 3 July 2001. 3. With regard to the reduced permissible sound power levels of stage II referred to in Article 12, these provisions shall apply with effect from 3 January 2006. 4. When Member States adopt these measures, they shall contain a reference to this Directive or shall be accompanied by such reference on the occasion of their official publication. The methods of making such reference shall be laid down by Member States. 5. Member States shall communicate to the Commission the texts of the provisions of national law which they adopt in the field governed by this Directive. Equipment consisting of a minimum of a work platform, an extending structure and a chassis. The work platform is a fenced platform or a cage which can be moved under load to the required working position. 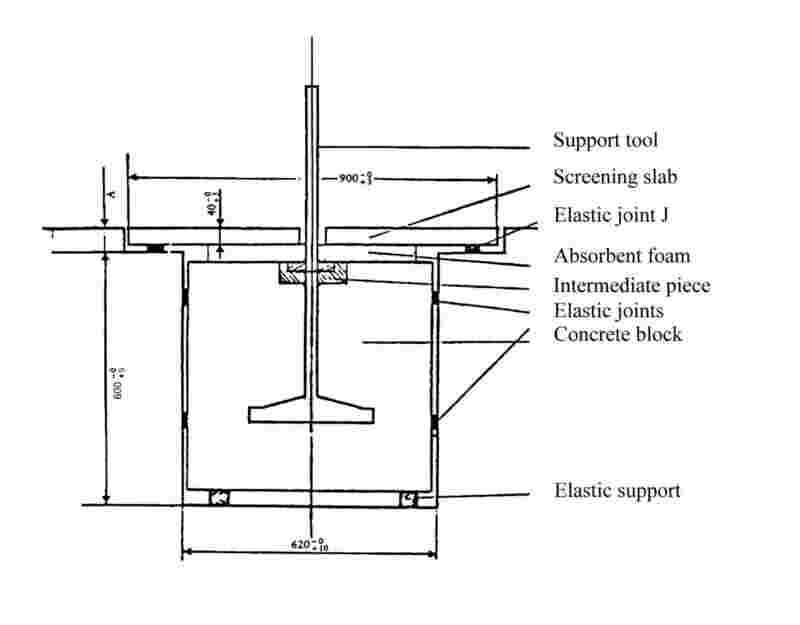 The extending structure is connected to the chassis and supports the work platform; it allows movement of the work platform to its required position. A combustion-engine driven portable hand-held unit fitted with a rotating blade made of metal or plastic intended to cut weeds, brush, small trees and similar vegetation. The cutting device operates in a plane approximately parallel to the ground. — and where the guides require support from separate structures. A hand-fed powered machine weighing less than 200 kg fitted with a single saw blade in the form of a continuous band mounted on and running between two or more pulleys. — the saw may be fitted with an additional, manually operated travelling table (not adjacent to the sawblade). A power-driven tool designed to cut wood with a saw chain and consisting of an integrated compact unit of handles, power source and cutting attachment, designed to be supported with two hands. A vehicle which may work either as a high pressure flusher or as a suction vehicle. See high pressure flusher and suction vehicle. — explosion rammers: compaction machines with mainly a flat pad as the compacting tool which is made to move in a predominantly vertical direction by explosion pressure. The machine is operated by an attending operator. Any machine for use with interchangeable equipment which compresses air, gases or vapours to a pressure higher than the inlet pressure. A compressor comprises the bare compressor itself, the prime mover and any component or device supplied, which is necessary for safe operation of the compressor. Powered (by any method) concrete-breakers and picks used to perform work on civil engineering and building sites. A machine to prepare concrete or mortar, irrespective of the loading, mixing and emptying process. It may be operated intermittently or constantly. Concrete mixers on trucks are called truck mixers (see definition 55). A power-operated, temporarily installed lifting appliance which is equipped with means for raising and lowering a suspended load. — for mortar mechanically by piston, worm, hose and rotor pumps or pneumatically by compressors with or without air chamber. These machines may be mounted on trucks, trailers or special vehicles. A temporarily installed machine suitable for transporting material by means of a power-driven belt. A cargo space refrigeration unit on vehicle categories N2, N3, O3 and O4 as defined by Directive 70/156/EEC. The refrigeration unit may be powered by means of an integral part of the refrigeration unit, a separate part attached to the vehicle body, a driving engine of the vehicle, or by an independent or standby power source. A self-propelled wheeled or crawler machine used to exert a push or pull force through mounted equipment. Drill rigs are stationary during drilling. They may move from one place of work to another, under their own power. Self-propelled drill rigs include those mounted on lorries, wheeled chassis, tractors, crawlers, skid bases (pulled by winch). When drill rigs are mounted on lorries, tractors and trailers, or a wheel-based, transportation may be carried out at higher speeds and on public roads. A self-propelled machine wheeled or crawler machine having an open body, which either transports and dumps or spreads material. Dumpers may be equipped with integral self-loading equipment. Powered devices attached to silo or tanker trucks for loading or unloading of liquids or bulk material by means of pumps or similar equipment. A self-propelled crawler or wheeled machine having an upper structure capable of a minimum of 360° rotation, which excavates, swings and dumps material by the action of a bucket fitted to the boom and arm or telescopic boom, without moving the chassis or undercarriage during any one cycle of the machine. A self-propelled wheeled or crawler machine having a main structural support designed to carry both a front-mounted bucket loading mechanism and a rear-mounted backhoe. When used in the backhoe mode, the machine normally digs below ground level with bucket motion towards the machine. The backhoe lifts, swings and discharges material while the machine is stationary. When used in the loader mode, the machine loads or excavates through forward motion of the machine, and lifts, transports and discharges material. A container, built of whatever material, that is used for the collection of bottles. It is equipped with at least one opening for filling in bottles and another one for emptying the container. A self-propelled wheeled machine having an adjustable blade, positioned between front and rear axles, which cuts, moves and spreads material usually to grade requirements. A combustion-engine driven portable hand-held unit fitted with flexible line(s), string(s), or similar non-metallic flexible cutting elements, such as pivoting cutters, intended to cut weeds, grass or similar soft vegetation. The cutting device operates in a plane approximately parallel (grass trimmer) or perpendicular (grass edge trimmer) to the ground. Hand-held, integrally driven powered equipment which is designed for use by one operator for trimming hedges and bushes utilising one or more linear reciprocating cutter blades. A vehicle equipped with a device to clean sewers or similar installations by means of a high pressure water jet. The device may be either mounted on a proprietary vehicular truck chassis or incorporated into its own chassis embodiment. The equipment may be fixed or demountable as in the case of an exchangeable bodywork system. — stationary high pressure water jet machines are designed to be used at one site for a length of time but capable of being moved to another site with suitable equipment. Generally skid or frame-mounted with supply line capable of being disconnected. Equipment which uses the hydraulic power source of the carrier machine to accelerate a piston (sometimes gas-assisted), which then hits a tool. The stress wave generated by kinetic action flows through the tool into the material, which causes the material to break. Hydraulic hammers need a supply of pressurised oil to function. The complete carrier/hammer unit is controlled by an operator, usually seated in the cabin of the carrier. Any machine for use with interchangeable equipment which compresses liquids to a pressure higher than the inlet pressure. It means an assembly of a prime mover, pump, with or without reservoir and accessories (e.g. controls, pressure relief valve). A self-propelled wheeled compaction machine having a front-mounted loader linkage with a bucket having steel wheels (drums) primarily designed to compact, move, grade, and load soil, landfill or sanitary (refuse) materials. — non-metallic filament line(s) or freely pivoting non-metallic cutter(s) with a kinetic energy of more than 10 J each; the kinetic energy is determined using EN 786:1997, Annex B. Also a walk-behind or ride-on grass cutting machine or a machine with grass-cutting attachment(s) where the cutting device is rotating about a horizontal axis to provide a shearing action with a stationary cutter bar or knife (cylinder mower). An electrically powered walk-behind or hand-held grass cutting machine with cutting element(s) of non-metallic filament line(s) or freely pivoting non-metallic cutters with a kinetic energy of not more than 10 J each, intended to cut grass or similar soft vegetation. The cutting element(s) operate(s) in a plane approximately parallel (lawn trimmer) or perpendicular (lawn edge trimmer) to the ground. The kinetic energy is determined using EN 786:1997, Annex B. A powered machine appropriate to clear lawns, paths, ways, streets, etc. of leaves and other material by means of a high velocity air flow. It may be portable (hand-held) or not portable but mobile. A powered machine suitable for collecting leaves and other debris using a suction device consisting of a power source which produces a vacuum inside the machine and a suction nozzle and a container for the collected material. It may be portable (hand-held) or not portable but mobile. — other counterbalanced lift trucks, excluded are those counterbalanced lift trucks that are specifically constructed for container handling. A self-propelled wheeled or crawler machine having an integral front-mounted bucket-supporting structure and linkage, which loads or excavates through forward motion of the machine, and lifts, transports and discharges material. A self-powered jib crane capable of travelling, loaded or unloaded, without the need for fixed runways and relying on gravity for stability. It operates on tyres, crawlers or with other mobile arrangements. In fixed positions it may be supported by outriggers or other accessories increasing its stability. The superstructure of a mobile crane may be of the type of full-circle slewing, of limited slewing or non-slewing. It is normally equipped with one or more hoists and/or hydraulic cylinders for lifting and lowering the jib and the load. Mobile cranes are equipped either with telescopic jibs, with articulated jibs, with lattice jibs, or a combination of these, of such a design that may readily be lowered. The loads suspended from the jib may be handled by hook block assemblies or other load-lifting attachments for special services. An appropriate designed container fitted with wheels intended to store waste temporarily, and which is equipped with a cover. — propelled by one or various wheel(s) directly actuated from the engine and equipped with hoeing tools (motor hoe with drive wheel(s)). A mobile road construction machine used for the purpose of applying layers of construction material, such as bituminous mix, concrete and gravel on surfaces. 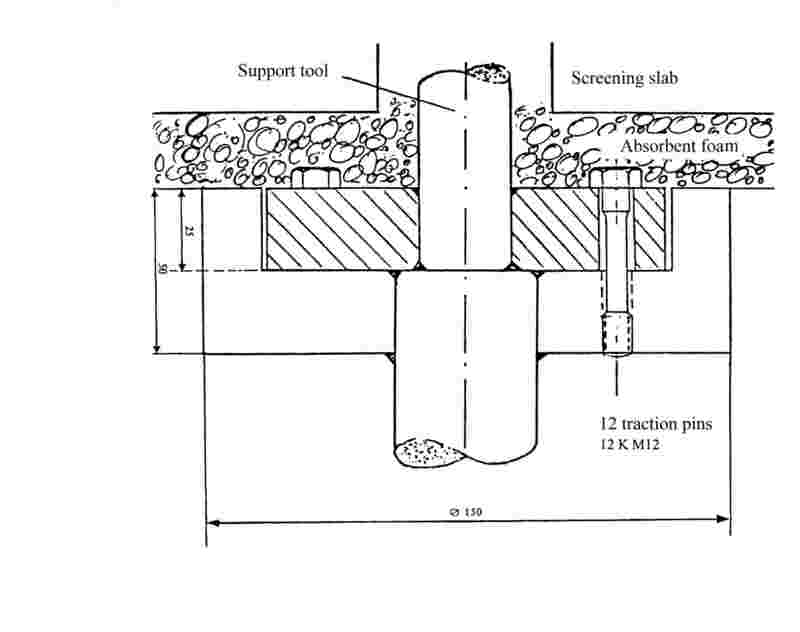 Paver-finishers may be equipped with a high-compaction screed. — accessories, e.g. pile caps, helmets, plates, followers, clamping devices, pile handling devices, pile guides, acoustic shrouds and shock/vibration absorbing devices, power packs/generators and personal lifting devices or platforms. A self-propelled crawler or wheeled machine specifically designed to handle and lay pipes and carry pipeline equipment. The machine, the design of which is based on a tractor, has especially designed components such as undercarriage, main frame, counterweight, boom and load-hoist mechanism, and vertically pivoting side boom. A self-propelled crawler machine used to exert a push or pull force on snow and ice through mounted equipment. Any device comprising an internal combustion engine driving a rotary electrical generator producing a continuous supply of electrical power. A sweeping collection machine having equipment to sweep debris into the path of a suction inlet that would then pneumatically by way of a high velocity airstream or with a mechanical pick-up system convey the debris to a collection hopper. The sweeping and collecting devices may either be mounted to a proprietary vehicular truck chassis or incorporated into its own chassis embodiment. The equipment can be fixed or demountable as in the case of an exchangeable bodywork system. A vehicle designed for the collection and transportation of domestic and bulky waste based on loading via containers or by hand. The vehicle may be equipped with a compaction mechanism. A refuse collection vehicle comprises a chassis with cab onto which the bodywork is mounted. It may be equipped with a container lifting device. A mobile machine used for removing material from paved surfaces using a power-driven cylindrical body, on which surface the milling tools are fitted; the cutter drums rotate during the cutting operation. A walk-behind or ride-on powered machine which uses the ground to determine the depth of cut and which is equipped with an assembly appropriate to slit or scratch the surface of the lawn in gardens, parks and other similar areas. A powered machine designed for use in a stationary position having one or more cutting devices for the purpose of reducing bulk organic materials to smaller pieces. Generally it consists of a feed intake opening through which material (which may be held by an appliance or not) is inserted, a device which cuts up the material by whatever method (cutting, chopping, crushing or other methods) and a discharge chute through which the cut material is discharged. A collecting device may be attached. A machine with which snow can be removed from traffic areas by rotating means, accelerated and ejected by blower means. A vehicle equipped with a device to collect water, mud, sludge, refuse or similar material from sewers or similar installations by means of a vacuum. The device may be either mounted on a proprietary vehicular truck chassis or incorporated into its own chassis embodiment. The equipment may be fixed or demountable as in the case of an exchangeable bodywork system. A slewing jib crane with the jib located at the top of a tower which stays approximately vertical in the working position. This power-driven appliance is equipped with means for raising and lowering suspended loads and for the movement of such loads by changing the load-lifting radius, slewing, travelling of the complete appliance. Certain appliances perform several but not necessarily all of these movements. The appliance can be installed in a fixed position or equipped with means for displacing or climbing. A self-propelled, ride-on or pedestrian-controlled, crawler or wheeled machine, having a front- or rear-mounted excavator linkage and attachment, primarily designed to produce trenches in a continuous operation, through a motion of the machine. A vehicle which is equipped with a drum to transport ready-mixed concrete from the concrete mixing plant to the job site; the drum may rotate when the vehicle is driving or stand still. The drum is emptied on the job site by rotating the drum. The drum is driven either by the driving engine of the vehicle or by a supplementary engine. A machine consisting of a water pump itself and the driving system. Water pump means a machine for the raising of water from a lower to a higher energy level. 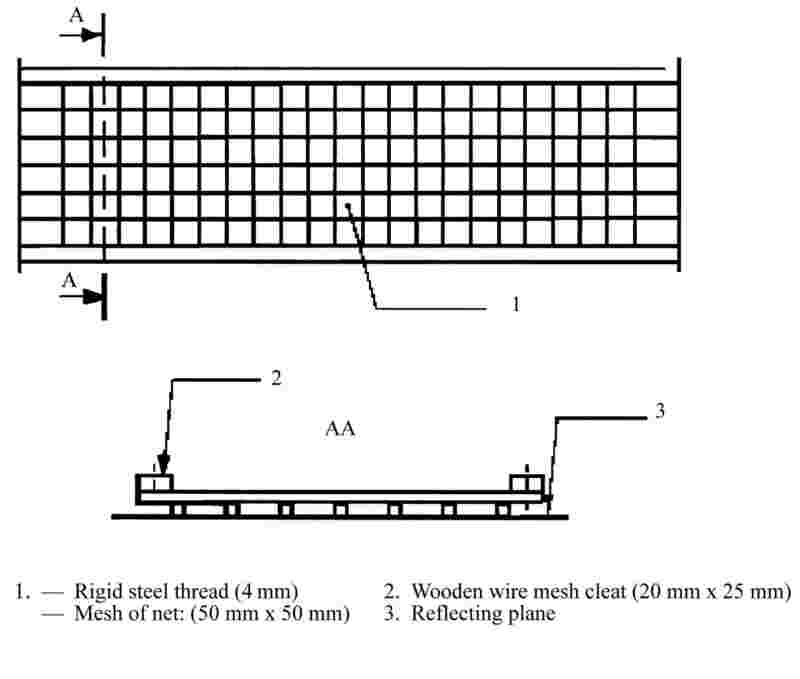 Any rotary device which produces a welding current. — particulars of the signatory authorised to sign the legally binding declaration for the manufacturer or his authorised representative established in the Community. This Annex lays down the methods of measurement of airborne noise that shall be used for the determination of the sound power levels of equipment covered by this Directive with a view to the conformity assessment procedures of this Directive. 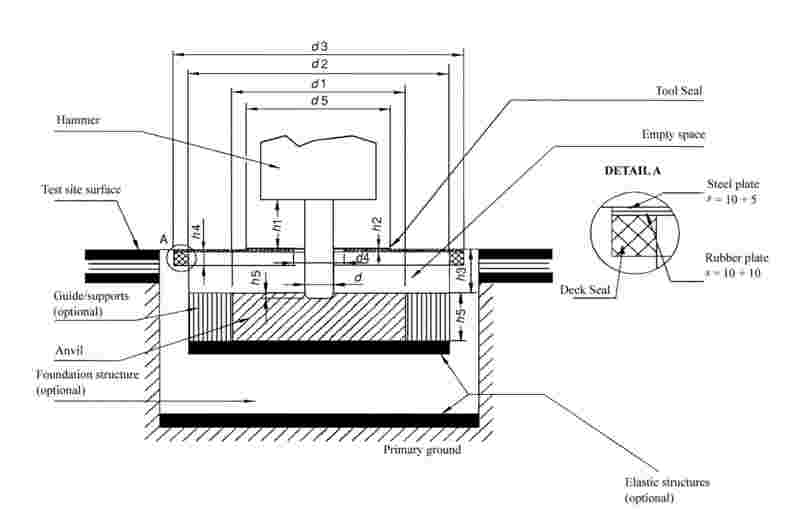 for measuring the sound pressure level on a measurement surface enveloping the source and for calculating the sound power level produced by the source. When testing specific types of equipment, the manufacturer or his authorised representative in the Community may in general choose one of the basic noise emission standards of Part A and apply the operating conditions of Part B for this specific type of equipment. In the event of a dispute, however, the recommended basic noise emission standard laid down in Part B has to be used together with the operating conditions of Part B. Measurement uncertainties are not taken into account in the framework of conformity assessment procedures in the design phase. If the engine of the equipment or its hydraulic system is fitted with (a) fans(s) it (they) must operate during the test. The fan speed is, in accordance with one of the following conditions, stated and set by the manufacturer of the equipment and must appear in the test report, this speed being used in further measurements. If the fan drive is directly connected to the engine and/or hydraulic equipment (e.g. by belt drive) it must operate during the test. — L pA,100 % is the sound pressure level determined with the fan set at maximum speed. If the fan can work at continuous variable speed, the test shall be carried out either according to 2.1(b) or with the fan speed set by the manufacturer at no less than 70 % of the maximum speed. For these measurements, the engine and hydraulic system of the equipment must be warmed up in accordance with the instructions, and safety requirements must be observed. The test is carried out with the equipment in a stationary position without operating the working equipment or travelling mechanism. For the purpose of the test, the engine will idle at no less than the rated speed corresponding to the net power ( 18 ). If the machine is powered by a generator or from the mains, the frequency of the supply current, specified for the motor by the manufacturer, shall be stable at ± 1 Hz if the machine is equipped with an induction motor, and the supply voltage at ± 1 % of the rated voltage if the machine is equipped with a commutator motor. The supply voltage is measured at the plug of a non-detachable cable or cord, or at the inlet of the machine if a detachable cable is provided. The waveform of the current supplied from the generator shall be similar to that obtained from the mains. If the machine is powered by battery, the battery shall be fully charged. The speed used and the corresponding net power are stated by the manufacturer of the equipment and must appear in the test report. If the equipment is fitted with several engines, they must work simultaneously during the tests. If this is not possible, each possible combination of engine(s) is to be tested. For these measurements, the engine (driving device) and hydraulic system of the equipment must be warmed up in accordance with the instructions, and safety requirements must be observed. No signalling device such as a warning horn or reversing alarm is to be operated during the test. The speed or velocity of the equipment during the test must be recorded and appear in the test report. If the equipment is fitted with several engines and/or aggregates they must work simultaneously during the tests. If this is not possible, each possible combination of engine(s) and/or aggregates is to be tested. For each type of equipment that is to be tested under load, specific operating conditions must be laid down which shall, in principle, produce effects and stresses similar to those encountered under actual working conditions. Conventional operating conditions for each type of hand-operated equipment shall be laid down that produce effects and stresses similar to those undergone under actual working conditions. The surface sound pressure level shall be determined at least three times. If at least two of the determined values do not differ by more than 1 dB, further measurements will not be necessary; otherwise the measurements shall be continued until two values differing by no more than 1 dB are obtained. The A-weighted surface sound pressure level to be used for calculating the sound power level is the arithmetic mean of the two highest values that do not differ by more than 1 dB. The A-weighted sound power level of the source under test shall be reported to the nearest whole number (less than 0,5 use the lower number; greater than or equal to 0,5 use the higher number). The report shall contain the technical data necessary to identify the source under test as well as the noise test code and the acoustical data. In addition to clauses 7.2.1 and 7.2.2 of EN ISO 3744:1995 a set of 12 microphones on the hemispherical measurement surface may be used. 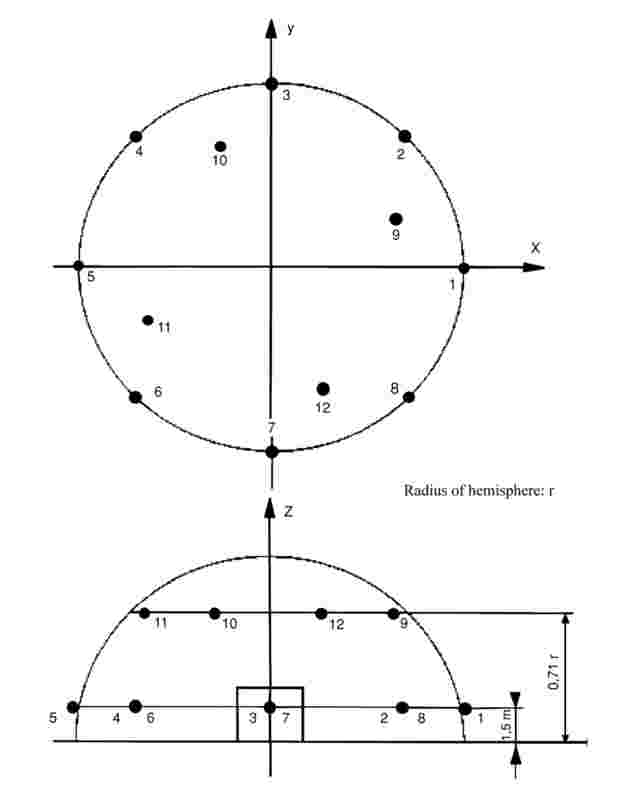 The location of 12 microphone positions distributed on the surface of a hemisphere of radius r are listed in the form of Cartesian coordinates in the following table. The radius r of the hemisphere shall be equal to or greater than twice the largest dimension of the reference parallelepiped. 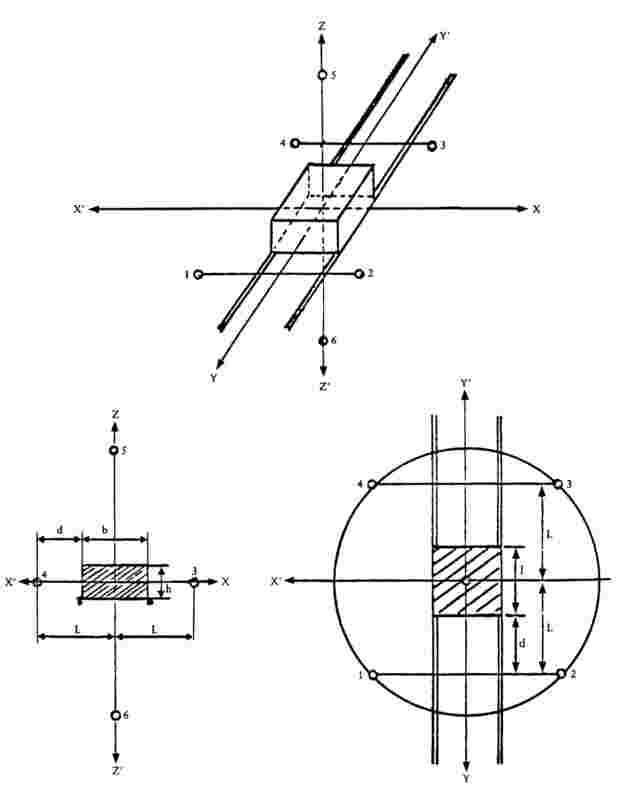 The reference parallelepiped is defined as the smallest possible rectangular parallelepiped just enclosing the equipment (without attachments) and terminating on the reflecting plane. 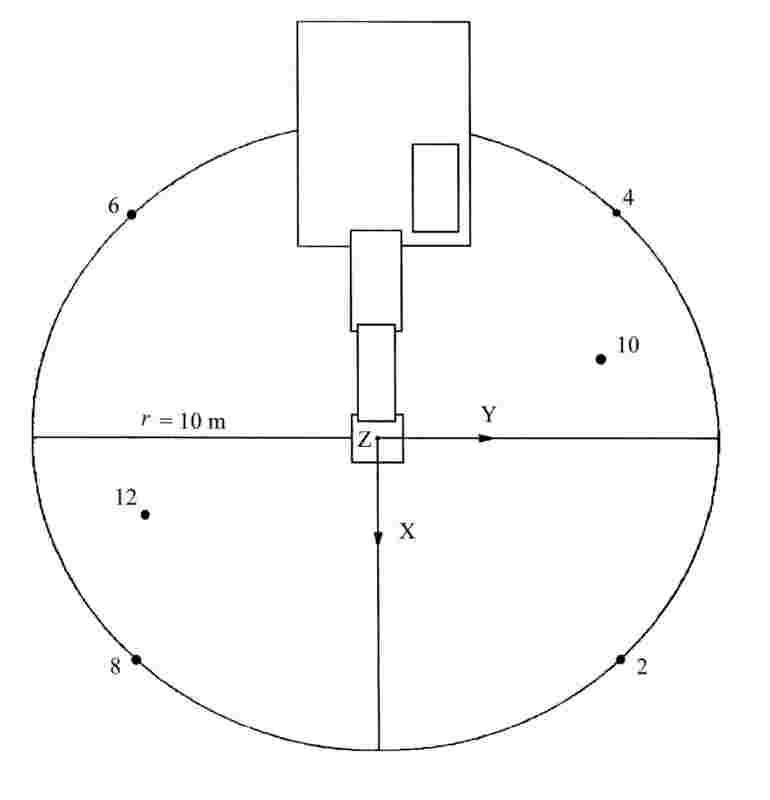 The radius of the hemisphere shall be rounded to the nearest higher of the following values: 4, 10, 16 m.
The number (12) of microphones may be reduced to six, but the microphone positions 2, 4, 6, 8, 10 and 12 following the requirements of clause 7.4.2 of EN ISO 3744:1995 have to be used in any case. 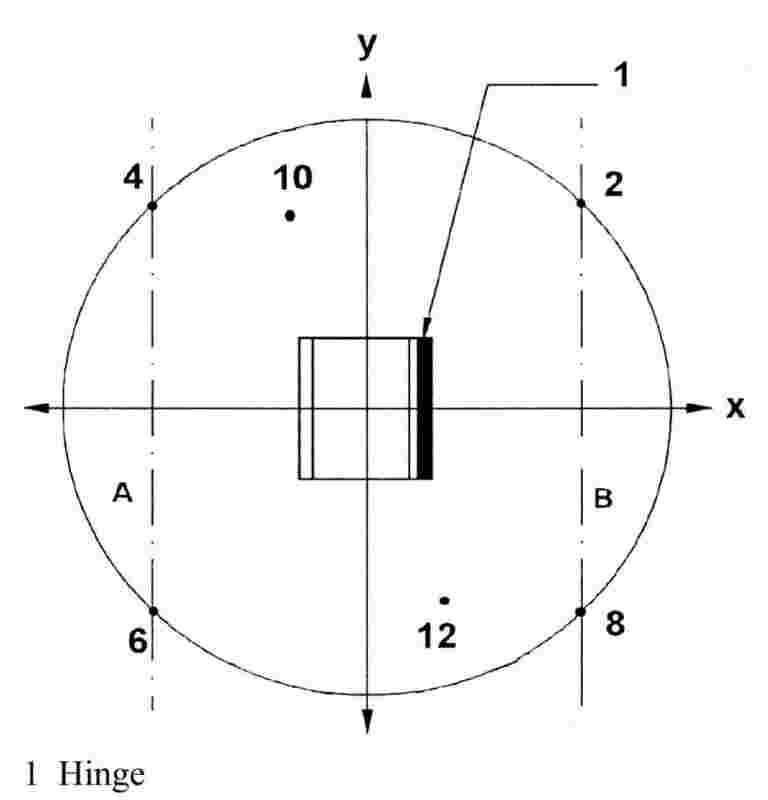 Generally the arrangement with six microphone positions on a hemispherical measurement surface has to be used. If there are other specifications laid down in a noise test code in this Directive for a specific equipment, these specifications shall be used. Equipment shall be measured on a reflecting surface of concrete or non-porous asphalt, then the environmental correction K 2A is set to K 2A = 0. If there are other specifications laid down in a noise test code of this Directive for a specific equipment, these specifications shall be used. The compressors shall be installed on the reflecting plane; skid-mounted compressors shall be placed on a support 0,40 m high, unless otherwise required by the manufacturer's conditions of installation. The conveying system and the pipe shall be filled with a medium similar to concrete, the cement being replaced by an admixture, e.g. finest ash. The machine shall operate at its maximum output, the period of one working cycle being not more than 5 seconds (if this period is exceeded, water shall be added to the ‘concrete’ in order to reach this value). ‘The engine shall be operated at its maximum governed speed (high idle). The transmission control shall be set to neutral. Bring the bucket to the tipped position (emptying) up to about 75 % of its maximum movement and return it to its travelling position three times. This sequence of events is considered to be a single cycle for the stationary hydraulic mode. — mass: 370 ± 30 g.
If necessary the operator can move temporarily to raise the lid. During the test, for a 2-wheel container, the angle between the container and the track shall be 45°. For a 4-wheel container, the operator shall ensure an appropriate contact of all the wheels with the track. The period of observation T shall be equal to the duration necessary to cover the distance between point A and point B on the track. Hemisphere/6 microphone positions according to Part A item 5/according to Part A item 5. If l > 2 m: a parallelepiped according to EN ISO 3744:1995 may be used with measuring distance d = 1 m.
The refuse collection vehicle shall be tested in a stationary position for the following operating conditions. 4. at least three complete work-cycles, each including the falling of 30 tubes into the hopper. Each cycle shall not exceed 5 seconds. 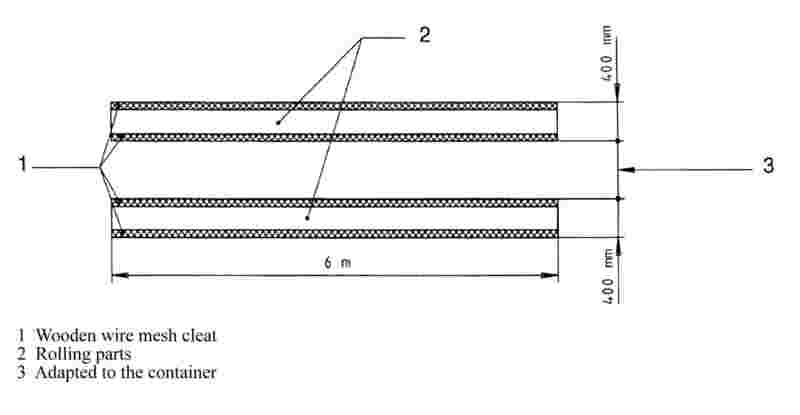 For these measurements L pAeq,T is replaced by L pA,1s. The resulting sound power level (L WA4) shall be the root mean square value of the three (or more) measurements. In the case of a refuse collection vehicle only electrically supplied, the coefficient associated to L WA1 is assumed to be equal to 0. The value of the constant K 2A, determined without artificial surface and in accordance with Annex A to EN ISO 3744:1995, shall be ≤ 2,0 dB, in which case K 2A shall be disregarded. Hemisphere/6 microphone positions according to Part A paragraph 5/according to Part A paragraph 5. Iff the CE marking is reduced or enlarged according to the size of the equipment the proportions given in the above drawing must be respected. The various components of the CE marking must have substantially the same vertical dimension which may not be less than 5 mm. 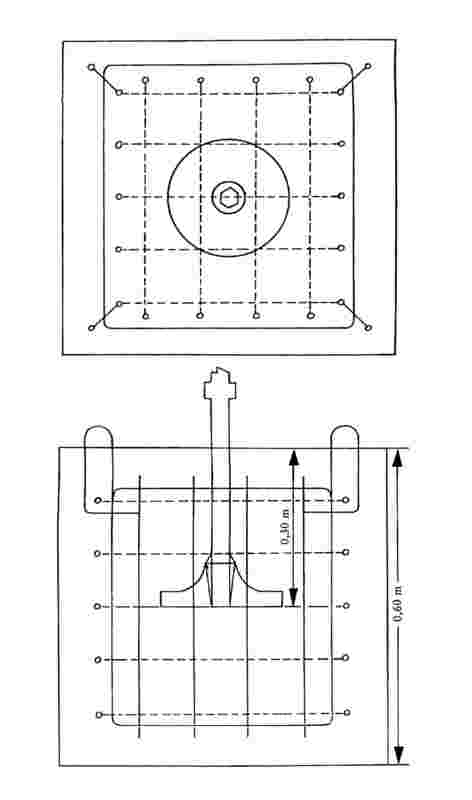 If the indication is reduced or enlarged according to the size of the equipment the proportions given in the above drawing must be respected. However, the vertical dimension of the indication should, if possible, not be less than 40 mm. 1. This Annex describes the procedure whereby the manufacturer, or his authorised representative established within the Community, who carries out the obligations laid down in point 2, ensures and declares that the equipment concerned satisfies the requirements of this Directive. The manufacturer, or his authorised representative established in the Community, must affix the CE marking of conformity and the indication of the guaranteed sound power level as required in Article 11 to each piece of equipment and draw up a written EC declaration of conformity as required in Article 8. 2. The manufacturer, or his authorised representative established in the Community, must draw up the technical documentation described in point 3 and he must keep it for a period ending at least 10 years after the last product has been manufactured at the disposal of the relevant national authorities for inspection purposes. The manufacturer, or his authorised representative established in the Community, may entrust another person to keep the technical documentation. In this case he has to include the name and address of this person in the EC declaration of conformity. — the technical instruments applied and the results of the evaluation of the uncertainties due to production variation and their relation to the guaranteed sound power level. 4. The manufacturer must take all measures necessary in order that the manufacturing process ensures continuing compliance of the manufactured equipment with the technical documentation referred to in points 2 and 3 and with the requirements of this Directive. This Annex describes the procedure whereby the manufacturer, or his authorised representative established in the Community, who carries out the obligations laid down in points 2, 5 and 6 ensures and declares that the equipment concerned satisfies the requirements of this Directive. 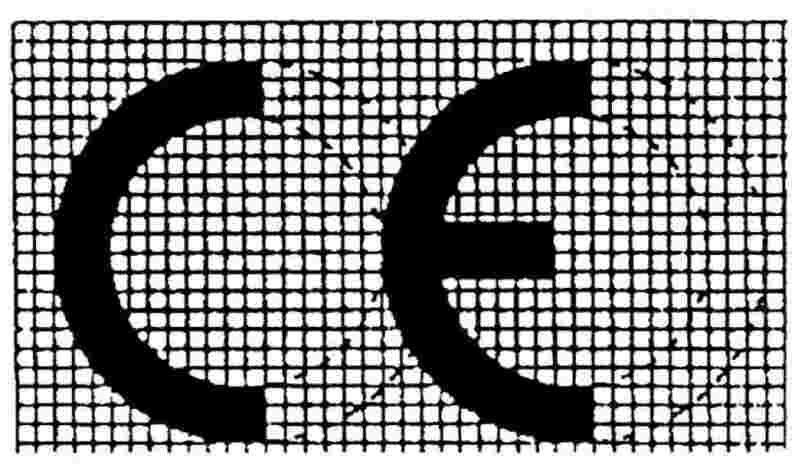 The manufacturer, or his authorised representative established in the Community, must affix the CE marking of conformity and the indication of the guaranteed sound power level as required in Article 11 to each piece of equipment and draw up a written EC declaration of conformity as required in Article 8. The manufacturer, or his authorised representative established in the Community, must draw up the technical documentation described in point 3 and he must keep it for a period ending at least 10 years after the last product has been manufactured at the disposal of the relevant national authorities for inspection purposes. The manufacturer, or his authorised representative established in the Community, may entrust another person to keep the technical documentation. In this case he has to include the name and address of this person in the EC declaration of conformity. The manufacturer must take all measures necessary in order that the manufacturing process ensures compliance of the manufactured equipment with the technical documentation referred to in points 2 and 3 and with the requirements of this Directive. The manufacturer, or his authorised representative established in the Community, shall present a copy of his technical documentation to a notified body of his choice before the first item of equipment is placed on the market or put into service. If there are doubts about the plausibility of the technical documentation, the notified body shall inform accordingly the manufacturer or his authorised representative established in the Community, and, if need be, carry out, or have carried out modifications to the technical documentation, or possibly, tests deemed necessary. After the notified body has issued a report confirming that the technical documentation satisfies the provisions of this Directive, the manufacturer or his authorised representative established within the Community may affix the CE marking to the equipment and issue an EC declaration of conformity in accordance with Articles 11 and 8, for which he will bear complete responsibility. The manufacturer, or his authorised representative established in the Community, shall give the notified body free access to all the internal documentation supporting these procedures, the actual results of the internal audits and the corrective actions which have been taken, if any. — issuing of the EC declaration of conformity according to Article 8. In both procedures, the frequency of the checks shall be defined by the notified body according to the results of previous evaluations, the need to monitor corrective actions and further guidance for the frequency of the checks that may be given by the yearly production and the general reliability of the manufacturer to maintain the guaranteed values; however a check shall be carried out at least once every three years. If there are doubts about the plausibility of the technical documentation or the adherence during production, the notified body shall inform accordingly the manufacturer, or his authorised representative established in the Community. In those cases where equipment checked does not conform to the provisions of this Directive, the notified body must inform the notifying Member State. This Annex describes the procedure whereby the manufacturer, or his authorised representative established in the Community, ensures and declares that the equipment which has been issued with the certificate referred to in point 4 conforms to the requirements of this Directive. The manufacturer, or his authorised representative established in the Community, must affix the CE marking supplemented by the information as required in Article 11 to the equipment and draw up the EC declaration of conformity referred to in Article 8. The application for a unit verification must be lodged by the manufacturer or his authorised representative established in the Community with a notified body chosen by him. — the reference to this Directive. — in accordance with this Directive, carry out or have carried out the necessary noise tests. Where the equipment meets the provisions of this Directive, the notified body must issue a certificate of conformity to the applicant as described in Annex X. If the notified body refuses to issue a certificate of conformity, it must state the detailed grounds for the refusal. The manufacturer, or his authorised representative established in the Community, must keep with the technical documentation copies of the certificate of conformity for a period of 10 years from the date on which the equipment is placed on the market. This Annex describes the procedure whereby the manufacturer who satisfies the obligations of point 2 ensures and declares that the equipment concerned satisfies the requirements of this Directive. The manufacturer, or his authorised representative established in the Community, must affix the CE marking supplemented by the information as required in Article 11 to each product and draw up the written EC declaration of conformity referred to in Article 8. The manufacturer must operate an approved quality assurance system for design, manufacture and final product inspection and testing as specified in point 3 and shall be subject to surveillance as specified in point 4. The manufacturer must lodge an application for assessment of his quality assurance system with a notified body of his choice. — the documentation concerning the quality assurance system. The quality assurance system must ensure compliance of the product with the requirements of the Directives that apply to it. All the elements, requirements and provisions adopted by the manufacturer shall be documented in a systematic and orderly manner in the form of written policies, procedures and instructions. The quality assurance system documentation must permit a common understanding of the quality policies and procedures such as quality programmes, plans, manuals and records. — the quality records, such as inspection reports and test data, calibration data, qualification reports of the personnel concerned, etc. — the means to monitor the achievement of the required design and product quality and the effective operation of the quality assurance system. The notified body must assess the quality assurance system to determine whether it satisfies the requirements referred to in point 3.2. It shall presume conformity with these requirements in respect of quality assurance systems that implement EN ISO 9001. The auditing team must have at least one member with experience as an assessor in the equipment technology concerned. The assessment procedure must include an assessment visit to the manufacturer's premises. The decision must be notified to the manufacturer. The notification must contain the conclusion of the examination and the reasoned assessment decision. The manufacturer must undertake to fulfil the obligations arising out of the quality assurance system as approved and to maintain it in an adequate and efficient manner. The manufacturer or his authorised representative established within the Community shall keep the notified body that has approved the quality assurance system informed of any intended updating of the quality assurance system. The notified body must evaluate the modifications proposed and decide whether the modified quality assurance system will still satisfy the requirements referred to in point 3.2 or whether a reassessment is required. 4.1. The purpose of surveillance is to make sure that the manufacturer duly fulfils the obligations arising out of the approved quality assurance system. — the quality records as foreseen by the design part of the quality assurance system, such as results of analyses, calculations, tests, etc. — the quality records as foreseen by the manufacturing part of the quality assurance system, such as inspection reports and test data, calibration data, qualification reports of the personnel concerned, etc. 4.3. The notified body shall periodically carry out audits to make sure that the manufacturer maintains and applies the quality assurance system and must provide an audit report to the manufacturer. 4.4. Additionally the notified body may pay unexpected visits to the manufacturer. During such visits the notified body may carry out, or cause to be carried out, tests to verify that the quality assurance system is functioning correctly, if necessary. The notified body must provide the manufacturer with a visit report and, if a test has taken place, with a test report. — the decisions and reports from the notified body which are referred to in the final paragraph of point 3.4, points 4.3 and 4.4. Each notified body must give the other notified bodies the relevant information concerning the quality assurance system approvals issued and withdrawn. 1. The body, its director and its staff responsible for carrying out verification operations may be neither the designer, builder, supplier or installer of the equipment nor the authorised representative of any of those parties. They may become involved neither directly nor as authorised representatives in the design, construction, marketing or maintenance of such equipment nor represent the parties engaged in these activities. This does not preclude the possibility of exchange of technical information between the manufacturer and the body. 2. The body and its staff must carry out the assessments and verifications with the highest degree of professional integrity and technical competence and must be free from all pressures and inducements, particularly financial, which might influence their judgement or the results of their work, especially from persons or groups of persons with an interest in the results of verification. 3. The body must have at its disposal the necessary staff and possess the necessary facilities to enable it to perform properly the technical and administrative tasks connected with inspection and surveillance operations; it must also have access to the equipment required for any special verification. — the ability to draw up the certificates, records and reports required to authenticate the performance of the tests. 5. The impartiality of inspection staff must be guaranteed. Their remuneration must not depend on the number of tests carried out or the results of such tests. 6. The body must take out liability insurance unless its liability is assumed by the State in accordance with national law, or the Member State itself is directly responsible for the tests. 7. The staff of the body must observe professional secrecy with regard to all information gained in carrying out its tests (except vis-à-vis the competent administrative authorities of the State in which its activities are carried out) under this Directive or any provisions of national law giving effect to it. ( 1 ) OJ C 124, 22.4.1998, p. 1. ( 2 ) OJ C 407, 28.12.1998, p. 18. ( 3 ) Opinion of the European Parliament of 1 April 1998 (OJ C 138, 4.5.1998, p. 84), Council common position of 24 January 2000 (OJ C 83, 22.3.2000, p. 1) and Decision of the European Parliament of 15 March 2000. ( 4 ) OJ L 33, 8.2.1979, p. 15. Directive as last amended by Commission Directive 85/405/EEC (OJ L 233, 30.8.1985, p. 9). ( 5 ) OJ L 300, 19.11.1984, p. 111. Directive as amended by Directive 88/665/EEC (OJ L 382, 31.12.1988, p. 42). ( 6 ) OJ L 300, 19.11.1984, p. 123. Directive as amended by Commission Directive 85/406/EEC (OJ L 233, 30.8.1985, p. 11). ( 7 ) OJ L 300, 19.11.1984, p. 130. Directive as amended by Directive 87/405/EEC (OJ L 220, 8.8.1987, p. 60). ( 8 ) OJ L 300, 19.11.1984, p. 142. Directive as amended by Commission Directive 85/407/EEC (OJ L 233, 30.8.1985, p. 16). ( 9 ) OJ L 300, 19.11.1984, p. 149. Directive as amended by Commission Directive 85/408/EEC (OJ L 233, 30.8.1985, p. 18). ( 10 ) OJ L 300, 19.11.1984, p. 156. Directive as amended by Commission Directive 85/409/EEC (OJ L 233, 30.8.1985, p. 20). ( 11 ) OJ L 300, 19.11.1984, p. 171. Directive as last amended by Directive 88/181/EEC (OJ L 81, 26.3.1988, p. 71). ( 12 ) OJ L 384, 31.12.1986, p. 1. Directive as last amended by Directive of the European Parliament and of the Council 95/27/EC (OJ L 168, 18.7.1995, p. 14). ( 13 ) OJ C 136, 4.6.1985, p. 1. ( 14 ) OJ L 220, 30.8.1993, p. 23. ( 15 ) OJ C 138, 17.5.1993, p. 1. ( 16 ) OJ L 184, 17.7.1999, p. 23. ( 17 ) OJ L 207, 23.7.1998, p. 1. Directive as amended by Directive 98/79/EC (OJ L 331, 7.12.1998, p. 1). ( 18 ) Net power means the power in ‘EC kW’ obtained on the test bench at the end of the crankshaft, or its equivalent, measured in accordance with the EC method of measuring the power of internal combustion engines for road vehicles, except that the power of the engine cooling fan is excluded.